This two-family brownstone, which is 20 feet wide on a 100-foot lot, has an owner's duplex over garden rental on brownstone block in Clinton Hill. It&apos;s an off-market listing that&apos;s available for $2.2 million through HomeCanvasr. BROOKLYN — You won’t find the roughly 90 properties currently listed for sale on the year-old real estate search platform HomeCanvasr on StreetEasy, the startup’s founders say. These hush-hush “off-market” or “pre-market” listings — posted without specific addresses and for members-only — aren’t on the behemoth search engine, which is why HomeCanvasr recently unveiled a new domain name, NotOnStreetEasy.com, as part of a guerrilla marketing campaign. In the city’s uber-competitive market that is plagued by low inventory, many buyers dream that there's some secret stash of homes that are available for sale but aren’t listed (often called “whisper listings") because once homes are posted on the hugely popular StreetEasy, they’re immediately seen by hundreds of house hunters and some times even snatched up, sight unseen. By tapping into the the peer-to-peer network trend, new web platforms like HomeCanvasr, which connects buyers and owners more directly, are looking for ways to circumvent the standard industry practices of brokers — and the 6 percent commission that comes with that, explained the site's co-founder Steven Szczur. These properties are off-market because the sellers may not want their addresses publicized, perhaps because they are privacy-seeking celebrities or have tenants they don’t want knowing about an upcoming sale, Szczur explained. Some are pre-market listings that brokers have, which close before marketing them widely. They may be listings from “sell curious” homeowners, usually investors, who aren’t actively trying to sell… but would for the right price. Others are estate sales, foreclosures or they may be “For Sale By Owners” or for sale by local brokers who prefer going a different route to avoid the standard 6 percent fee for sellers, half of which goes to the sellers’ broker and half to the buyers’ broker. 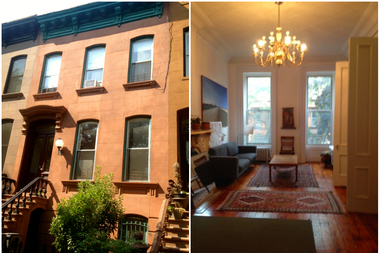 HomeCanvasr’s listings are primarily in Brownstone Brooklyn, with a smattering in Harlem. They average between $1.5 million to $2 million, Szczur said, with homes on it that have gone as low as $750,000 and as high as $5 million. The NotOnStreetEasy site showcases some recent sales made through the site, including a Park Slope townhouse that sold for $2.4 million and a Crown Heights home that sold for $1.5 million. Despite a focus on shifting away from brokers, HomeCanvasr recently started its own brokerage arm that is “willing to work for a lot lower than other brokers,” Szczur added. There are currently 1,800 users who have signed up with the site, which has three entry points: you can pay the $200 sign-up fee and then $50 a month; pay the sign up fee and agree to pay 1 percent commission to the brokerage or have the fees waived for three months if you get pre-approved by the mortgage specialist the firm works with, Szczur said, adding that users must be pre-approved to show they are serious about their search. They must also fill out a detailed questionairre about their home search. The site connects buyers and sellers “Craigslist-style,” allowing them to communicate without real email addresses in order to decide whether they want to take it to the next level and view the property. In one year, there were roughly a dozen sales that were facilitated through the site, Szczur said. Representatives from StreetEasy didn’t seem too threatened by the startup.